Adweek's second annual Arc Awards honor the best in brand storytelling. January is an interesting month for storytelling. At the outset you have the recently concluded Consumer Electronics Show in Las Vegas. This annual behemoth of a conference has traditionally focused on products and gadgetry. Notably, as computing power steadily increases and the promise of 5G connectivity floats tantalizingly on the horizon, brands will increasingly have the power to effect near one-to-one marketing via things like AI and IOT. But the promise of such personalization will only really work with a good brand story—and one told in concert with the consumer’s own narrative created by, you guessed it, technology. The bookend of the month is Sundance. This is the place where storytelling meets empathy and the spot where brands can showcase data-driven, non-interruptive creativity. Two years ago, Adweek saw this trend emerging and was lucky enough to partner with FPT Media, the producer of the BrandStorytelling@Sundance conference in Deer Valley, Utah, held during the Sundance Film Festival. 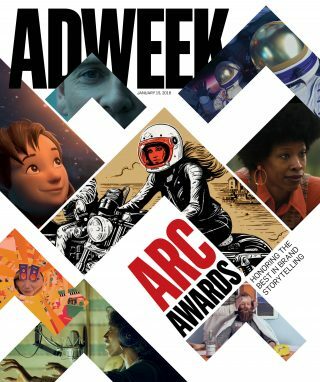 Last year, as part of that partnership, we created and hosted the inaugural Adweek Arc Awards to honor and celebrate the best brand storytelling of the year. 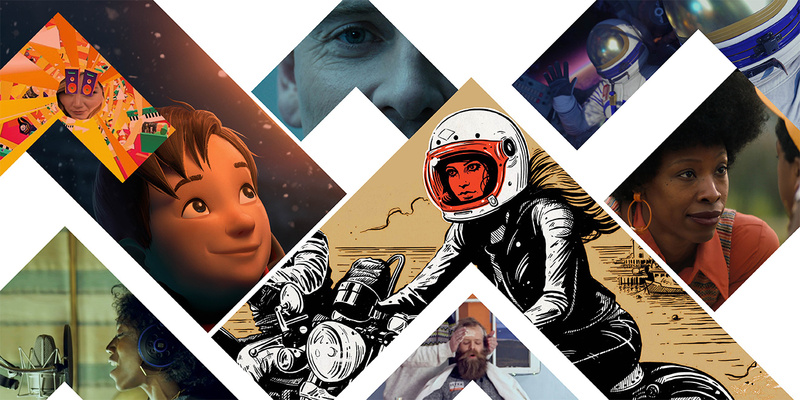 We return this year with our sponsor, Screenvision Media, and our Arc Awards jury on Jan. 18, as part of BrandStorytelling, highlighting the truly amazing work profiled in this issue—and where we reveal our Grand Arc Award winner. Stats: 13 million views; sold $650,000 in campaign-themed gift cards in 24 hours; drove a 77 percent increase in brand favorability; visits to Cineplex.com passed 146,000, beating objectives by nearly 300 percent, with an average online engagement of 7.5 minutes. Last April, a tweet from 16-year-old Carter Wilkerson asking Wendy’s for free chicken nuggets took on a life of its own, becoming a viral sensation, stoked by the chain’s red-hot social media team and agency VML. Acting in real time while staying on top of the cultural conversation “has helped build us as a ‘brand for me’ with our consumers,” said Christina Miller, VML’s associate channel director. #NuggsForCarter became the most retweeted tweet of all time (3.5 million). Bonus: Wilkerson earned a guest appearance on Ellen (the previous retweet record holder) and, of course, free grub for a year. Stats: #NuggsForCarter generated more than 2.5 billion earned media impressions from nearly 1,100 placements; along the way, Carter surpassed notable tweets from President Barack Obama and the boy band One Direction. In a bid to make the outdoors “the largest level playing field,” REI chronicled Georgia ultra-runner Mirna Valerio’s first 50K race of 2017. 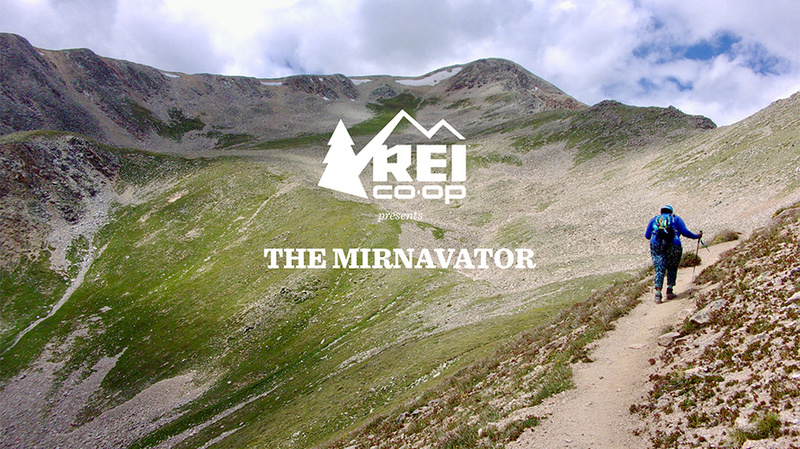 In the mini-doc, “The Mirnavator,” the athlete battled mud, heat and pain along with body shaming and harassment. It lit up the internet, becoming REI’s highest-performing video with more than 6 million views and transforming Valerio into a role model in the process. Capitalizing on the film’s success, REI launched 10 more mini-movies during the year aimed at making outdoor activity more accessible and inclusive, across gender, race, body size and aptitude. Dovetailing on its campaign, REI began carrying a broader range of clothing sizes in its stores. Stats: 80 percent of the video views came from organic traffic, 50,000-plus shares were generated across channels. Zulu Alpha Kilo set out to debunk the misperception that Harley-Davidson is a brand solely for white guys over 50, creating a 12-part documentary series that was “half road trip, half classic foreign-exchange” program, said the agency’s CEO and CCO Zak Mroueh. Featuring riders from Canada alongside those from New Zealand, Mexico and India, the film “challenge[s] the stereotypical image of what people think a Harley rider looks like by celebrating Canada’s diversity,” said Mroueh. Tapping into the “sense of discovery” found on the open road, this summer 2017 campaign racked up 8.7 million views and more than 47 million impressions, exceeding target goals by some 200 percent. Stats: more than 415,000 engagements with the video series; market share rose 1.9 percent against its nearest competitor, despite an overall industry drop of 3.8 percent. Stats: 533,869 people tuned in to watch; 23,882 liked or commented, for a 4.5 percent engagement rate. Deepening its Caribbean connection while embedding itself into the current pop music scene, Bacardi linked up with reggae-tinged Major Lazer and Spotify, donating free studio time to aspiring Caribbean artists. The campaign last summer gave fans the opportunity to “do what they’d normally do, listen to music they love, and help the up-and-coming Caribbean artists that influence so much of the music at the top of the charts nowadays,” said BBDO ecds Danilo Boer and Marcos Kotlhar. Overall, eight artists from six islands received studio time. Their tracks were released on a Spotify playlist, while the musicians kept all royalties. Stats: In two months, the Major Lazer song was played 4.3 million times, generating 128 hours of studio time; one of the Caribbean artists secured a major record deal. Only 2 percent of female-consumed media reflects the 67 percent of the women in the U.S. who are considered plus size. “The 67% Project” aims to change that. Taking “a stance on how media should look,” popular lifestyle site Refinery29 presented a diverse range of women across its editorial content during the fall of 2016, created body-realistic stock photography with Getty Images, and named TV stars Chrissy Metz (This Is Us) and Danielle Brooks (Orange Is the New Black) and blogger-designer Gabi Gregg as ambassadors. Bolstering the campaign with retailers Lane Bryant and Aerie, #SeeThe67 encouraged tweets about body-size bias, and the brand-sponsored Every Beautiful Body conference took on the issue of how women are represented in America. Stats: #SeeThe67 garnered 266 million social media impressions and 773 million press impressions; Danielle Brooks’ Instagram announcing her participation in the program snagged 373,000 views. Stat: more than 500,000 views (Polish version) in two weeks. What’s the life expectancy of someone with Down syndrome? Can he or she learn to ride a bike, read or play sports? People living with the genetic anomaly answered those questions and more via a 40-video YouTube series from FCB and the nonprofit Canadian Down Syndrome Society. In late 2016, “Down Syndrome Answers” created a “self-sustaining, always-on campaign” that also provided “expectant parents facing a Down syndrome diagnosis with a searchable resource,” explained FCB reps. As a result, the video series now turns up at the top of Google searches on the topic. Stats: 455 million media impressions; 240,000 video views; 893 percent increase in referral traffic to cdss.ca and a 101 percent increase in organic traffic to the site. In this digital era of emailing, texting and tweeting, the Paper and Packaging Board wanted to recapture “the emotional power of the handwritten word.” Enter the analog “Letters of Peace” campaign. The brand and agency Cramer-Krasselt filmed five survivors of terrorism and violence, including those from the Boston Marathon bombing and the Columbine shooting, reading aloud from their handwritten letters touching on themes of forgiveness, love and hope in its “How Life Unfolds” video series. The inspiring letters, the center of the brand’s holiday 2016 marketing effort, also ran as full-page ads in The Wall Street Journal. Custom content on Upworthy and Little Things promoted the videos, with broad distribution across digital and social platforms. Stats: 9.5 million total video views; 300 earned media placements; 350 million media impressions. Stats: In the first 72 hours, the initial video received more than 1.7 million views; fans started looking immediately for clues across Instagram, YouTube, Facebook, Twitter and Snapchat. Stats: Bacardi used Snap’s targeting to reach every U.S. user over 21; 18 million fans unlocked the Lens; the program amassed 29 years of viewing time in a single day. If the Bolsheviks had access to social media, Tsar Nicholas II might have live-tweeted his abdication while Vladimir Lenin could have summarized his famously long-winded speeches. That’s the thinking behind RT’s “#1917Live: What If Twitter Existed 100 Years Ago?” campaign. 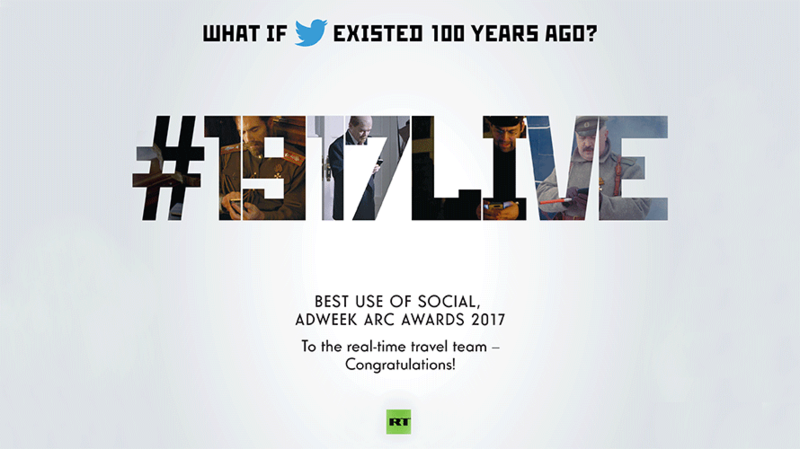 Launched in 2017, RT’s fictional media doppelganger, Russian Telegraph, created Twitter accounts for famous figures and invited users to virtual role play in this “digital time machine” with news updates and interactive Q&As. Over the course of a year, this back-to-the-future exercise generated 120,000 tweets with the #1917 hashtag, nabbing nearly 100,000 followers. Stats: More than 100 Twitter handles created by participants; the hashtag #1917Live generated more than 25 million impressions; fans include best-selling author Paulo Coelho (The Alchemist), historian Helen Rappaport, scholars at Oxford, politicians and journalists; the campaign has been covered by media in a dozen languages. After GE tapped into the popular podcast genre with its award-winning thriller, “The Message,” in 2015, the following year, the appliance giant raised the bar with “Life.Af/ter,” an AI adventure showcasing elements of “Her” and “Ex Machina” while highlighting the company’s advances in science and technology. The 10-episode fictional drama explored social media’s oversharing culture and the pitfalls of exposing so much of our lives online. Downloaded 1.8 million times, the series counts astrophysicist Neil deGrasse Tyson as a fan. Andy Goldberg, GE’s CCO, called the effort “a great way to reach audiences with a different message,” specifically GE’s work in digital twinning. Stats: 524,350,000 downloaded minutes, making it one of the most downloaded podcasts of the year; partners also created VoiceTree, a fictional social media site where fans could dig further into Life.Af/ter’s alternate reality. This breakout two-minute short, depicting black parents through the years having “the talk,” a discussion centered on racism, societal prejudice and survival (and not the birds and the bees), with their children, was named as one of Adweek’s “10 Best Ads of 2017.” Although not intended as a political statement, the brand “believed we could shed light on this process to help everyone understand how bias affects us all,” said Verna Coleman-Hagler, NA brand operations at P&G. The global powerhouse is committed to “representing the unique and diverse experiences of our consumers, and our brands will continue to tackle bias and its harmful effects,” she said. Following its August debut, “The Talk” pulled in more than 7 million views.